If you're looking for wild, tropical Australia, then look no further than Darwin. Nestled beside the Timor Sea, the Top End (as it's known by Australians) has some of the most adventurous and exotic experiences this world has to offer. Within a couple of hours you can see incredible wildlife, swim in stunning water holes and watch the most incredible sunsets. Here's our guide to the best things to do in and around Darwin. If there's one thing you shouldn't miss in Darwin it's a sunset at Mindil beach. It's a really spectacular spot to watch the sun set into the ocean. There's a popular market here too, Thursdays and Sundays from late April to late October. But even if your visit doesn't coincide, you definitely won't regret a sunset trip to Mindil. It doesn't get much better than fish and chips on the beach, with a glass of wine as you sit and watch the sunset. We'd highly recommend checking out where the fish and chip van 'Jetty and the Fish' is that evening and follow suit. BYO wine and grab some of the freshest fish in Australia. Delicious. 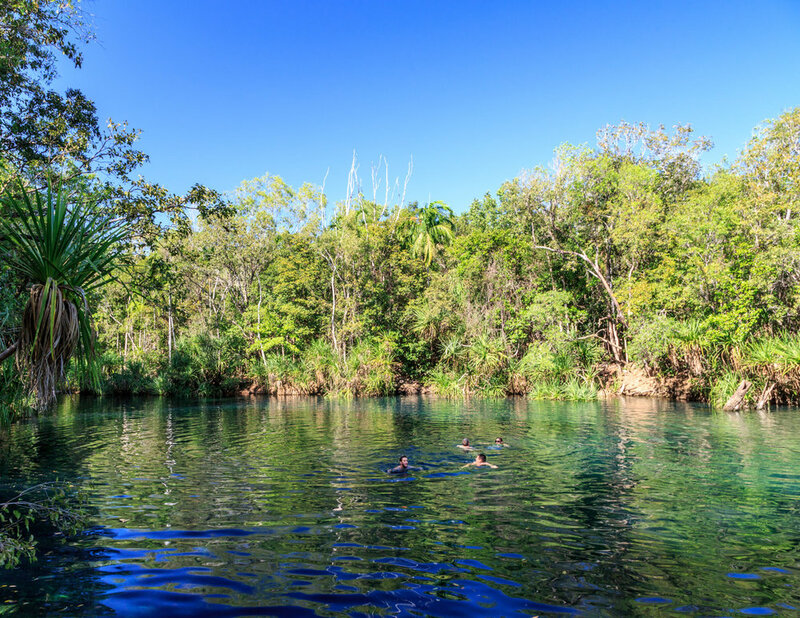 Berry Springs is just under 40 minutes drive from Darwin and is one of the most beautiful swimming spots we've been to. The water really is that blue, and it's warm too! We spent the morning watching the colourful bee eaters fly in and out of the trees as we slowly turned into prunes. Can you blame us? You will never want to leave! Grab a homemade ice cream from the kiosk before you leave, the passionfruit flavour is delicious! Mary River has the highest density of saltwater crocodiles in the world. It also has its fair share of freshies. We loved exploring the river by tinnie and cruising along croc watching at our own pace. Lots of people were fishing on the river but we wouldn't fancy attracting the crocs quite that close to our little tin can! There's also loads of birdlife, go late afternoon or early morning for the most bird and croc activity. You can rent a boat from Mary River Wilderness Retreat. 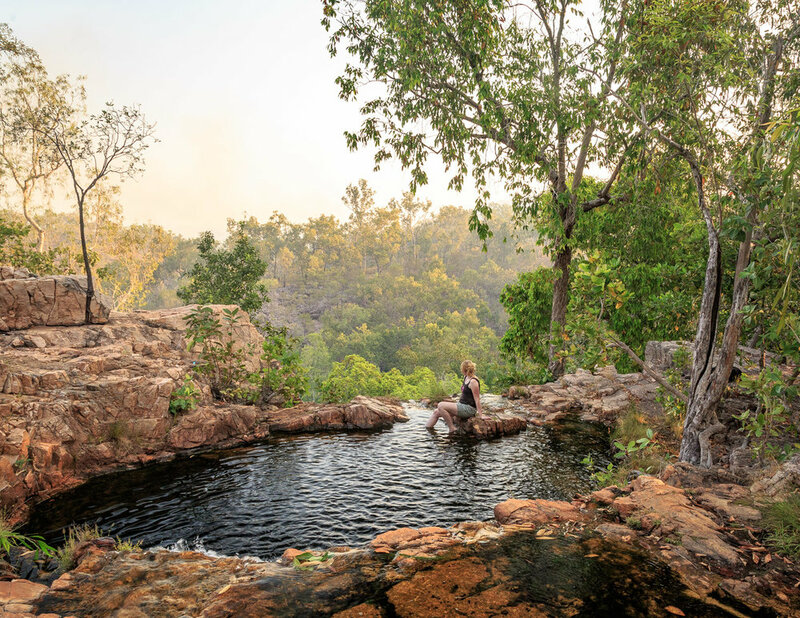 Less than a couple of hours from Darwin, Litchfield National Park is a bucket list worthy destination in itself. 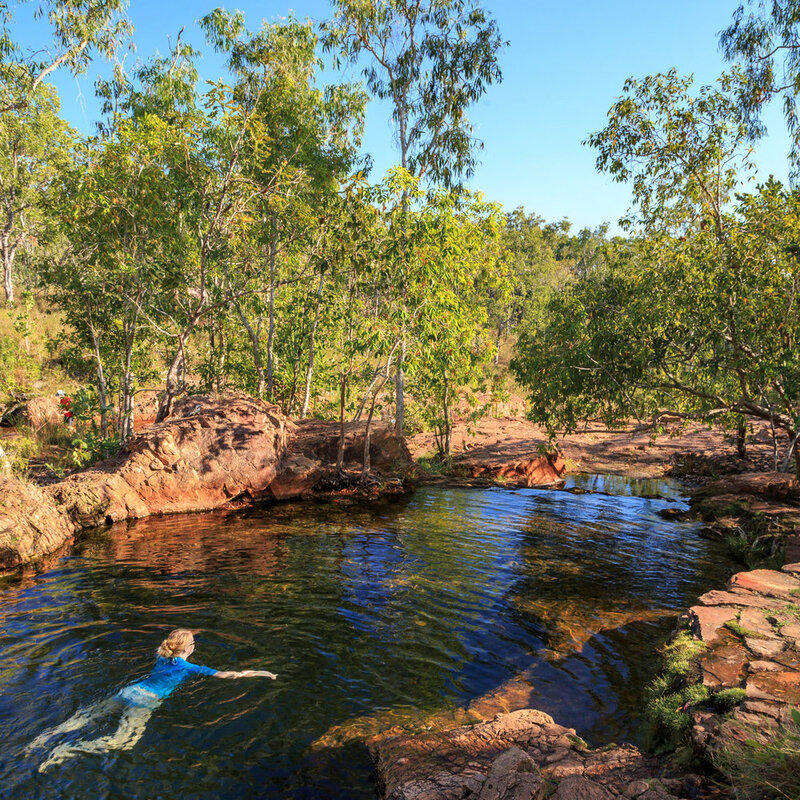 The waterholes here provide some of the best wild swimming opportunities on earth. Even if you aren't planning on going for a dip, Wangi Falls are worth the drive just to stand and admire. No photo we've ever seen can quite capture just how magnificent this area is. 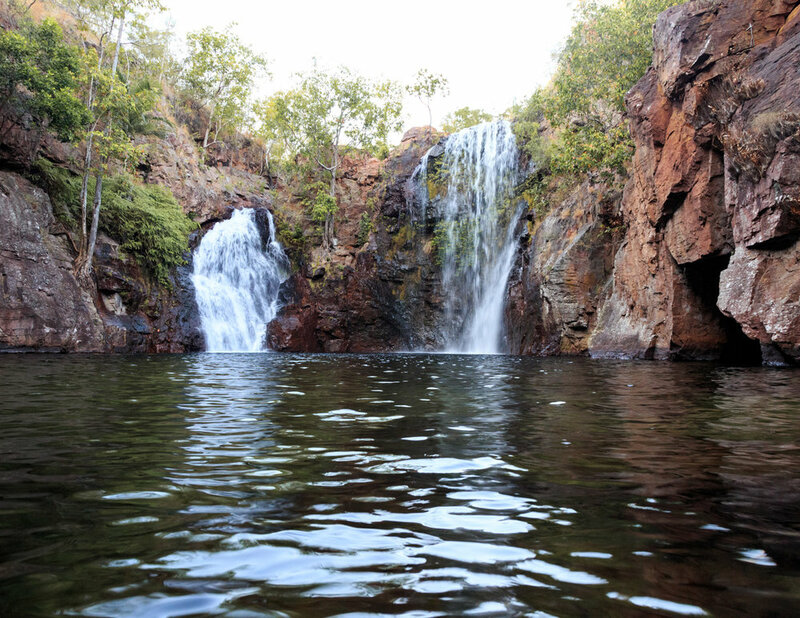 If you are keen to hit the water this is the biggest swimming hole in Litchfield National Park and the perfect place to grab a float and dive in. There are known to be freshwater crocs in this pool, though locals told us if we don't bother them, they won't bother us. The occasional saltie might also sneak in which is definitely not ok to swim with, so always check the signs and never swim if there has been a recent sighting. If you prefer to keep your feet dry there is a short walking track, 1.6km return, which gives you a good overview of the area from a higher vantage point. Florence falls are simply spectacular. As you leave the car park, before you descend to the falls themselves you get an amazing birds eye view and it's hard to believe you will be swimming there in less than ten minutes. We went early and had the entire pool to ourselves, the water was really cold as the sun was not yet up, but it was so worth it. This is the Australia you've been dreaming about. This series of cascades with several small swimming holes is one of our favourites. If you can, it's best to visit early morning as it is pretty popular, and could easily become crowded. They are a few different swimming holes but all are small, so for peace and tranquillity early is best. We stayed for over an hour and a half soaking up the views and watching the birds and butterflies flit between the trees. This really is a magical spot. I remember seeing these termite mounds on a nature documentary years ago and found it hard to believe they were real. The scale of them is just staggering, especially as they are created by such tiny creatures. They are scattered throughout the park but the area signed as the mounds, 17km from the park boundary, is where you will find the most concentrated area of them. The termites manage to regulate the temperature inside the mounds by aligning them north to south, just incredible! This waterhole had absolutely nobody there even though we visited at quite a popular time of day. It was such a beautiful spot to have all to ourselves, and can only imagine it's because there is a slightly longer walking track to get there, though it's still just 2.7km return. If you can visit late afternoon the golden light is simply spectacular. Due to cultural significance to the indigenous community, they ask you not to swim there but we can guarantee it's still worth the visit. The Top End has a distinct rainy season that runs from November until March which can make travel a little more challenging. The benefit is that there's far fewer visitors during this time. We visited in August which is the peak of the dry season and had magnificent weather: clear skies and warm temperatures. All the places we've talked about in this blog are easily accessed with a 2 wheel drive car, so a four wheel drive isn't essential. You can also get a tour from Darwin to Litchfield, but we'd highly recommend taking your time and exploring at your own pace. You wouldn't have expected it, but Darwin has two of our favourite Indian restaurants in Australia. We highly recommend Hanuman in the city centre (which also offers Thai Food) and Exotic North Indian Cuisine at Darwin Marina. Outside of Darwin, the majority of food is pub grub. The Argus Hotel is a great find in what can be a pricey city for accommodation. It's pretty new and the hotel is immaculately clean. The beds are comfortable, it's in a great location and is very good value. If you're looking for accommodation with character, then Rum Jungle Bungalows has it in bucket loads. All bungalows are set in a tropical courtyard with a pool in the middle. The bungalows themselves are quaint, immaculately clean and the perfect place to relax after a day in the national park. The host also leaves a breakfast pack of fruits and cereal for you to make yourself at the most convenient time. Great spot for birdwatchers too. The Mary River Wilderness Resort is a great rural spot in the Top End. It's the best place to stop on the way to Kakadu and jump in a boat and explore the area. The rooms are very good as well, clean, comfortable and quiet. Have you visited the Top End? Would you dare visit a place with highest density of Crocodiles in Australia? Let us know in the comments below. When is the best time to visit Darwin, Kakadu and Litchfield National Park?